Robert Thomas had a goal and an assist as the St. Louis Blues notched a 4-1 win over the visiting Buffalo Sabres on Thursday, extending the Blues' dominance over the Atlantic Division side. The Blues now have 22 wins in their last 25 games against Buffalo, including a 12-1-0 mark over their last 13 meetings. 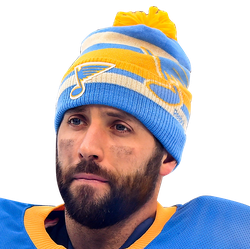 The Sabres haven't won in St. Louis in exactly nine years, going back to Dec. 27, 2009. After a scoreless first period, the Blues broke out to a 3-0 lead, started by Thomas' marker at 2:03 of the second period. Midway through the period, the Blues extended their lead in rapid fashion, as Jay Bouwmeester and Pat Maroon each scored within a 54-second stretch. Bouwmeester's goal was his first of the season, snapping a 37-game goalless drought for the veteran defenseman. Bouwmeester had plenty of space to take a pass from David Perron behind the net and fire it past Carter Hutton for what ended up as the game-winning goal. Perron and Alexander Steen each had two assists for St. Louis. After being traded from the Sabres to the Blues in the offseason, Ryan O'Reilly marked his first game against his former team with a goal 13:47 into the third period. O'Reilly leads the Blues with 14 goals. Jack Eichel accounted for Buffalo's only goal of the game, scoring a power-play effort at 17:25 of the second period. The red-hot Eichel now has 10 goals and seven assists over his last 10 games. Jake Allen saved 30 of 31 shots to earn his 13th win of the season. 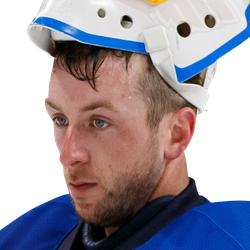 Hutton had 28 saves in the loss. The Blues have now won five of their last seven games, and they improved to 8-7-1 under interim head coach Craig Berube. Thursday's game was the opener of a five-game homestand for the Blues, who next host the Pittsburgh Penguins on Saturday. The Sabres have now lost three of their last four games and will look to rebound when they host the division rival Boston Bruins on Saturday.